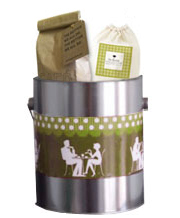 Everything for your bridal shower : Goodie Tins - The more sophisticated cousin of the gift basket. Gosh. You need to make sure her big day is perfect and this kit does just that. Pretty and fun just like your BFF.